Dillingham & Murphy (D&M) has been our law firm client in San Francisco for 30 years. We’ve negotiated many deals for the firm, in multiple economic cycles. We’ve always surrounded the firm with experts – including space planners, general contractors, furniture consultants and others – to culminate the most aggressive, sensible, space-efficient and affordable transactions. Our most recent assignment was to either renew their full-floor lease at 353 Sacramento Street, or negotiate for more suitable space and terms elsewhere. Complicating our task was the announcement by D&M’s landlord of their intent to sell the building. Our Team quickly studied D&M’s floor for future code compliance/engineering issues for any prospective new tenant amounting to over $100/sf – sharing our findings with the landlord, alongside our offer to renew on an as-is basis. However, the landlord and their selling broker insisted on implementing and applying the new BOMA measurements to D&M’s space – a bump up of more than 11% — and rental increases to the mid-$70s. None of this was acceptable, driving us to find palatable solutions outside of 353 Sacramento. D&M showed great flexibility as we approached the marketplace, noting that very little private-office intensive space exists in this tech-heavy city. We focused on creating alternatives, whether sublease or direct space, in the $40s and $50s….unheard of at the time, but nevertheless meeting our client’s financial objectives. Short-term subleases were strongly considered. D&M’s objective was also to land in Class A space without coming out of pocket for improvements or other relocation expenses. As in any simultaneous negotiation with several landlords, it only takes one highly motivated owner to create an opportunistic landscape for our negotiations—and we found a welcoming and accommodating landlord a vacancy at 601 Montgomery Street. The space we targeted had been on the market for quite a while. After seeing our reality-based marketplace assessment, the landlord, Montgomery Building/USL Property was agreed to pay for the renovation and moving costs we hoped for – and accommodating our client’s budget at just over $53/sf/year average for 5 years. The landlord provided allowances for all required improvements, window coverings, design fees, wiring costs, and relocation costs. That put one very happy client in essentially a brand new office space, and well located in the Financial District, with pleasant views. 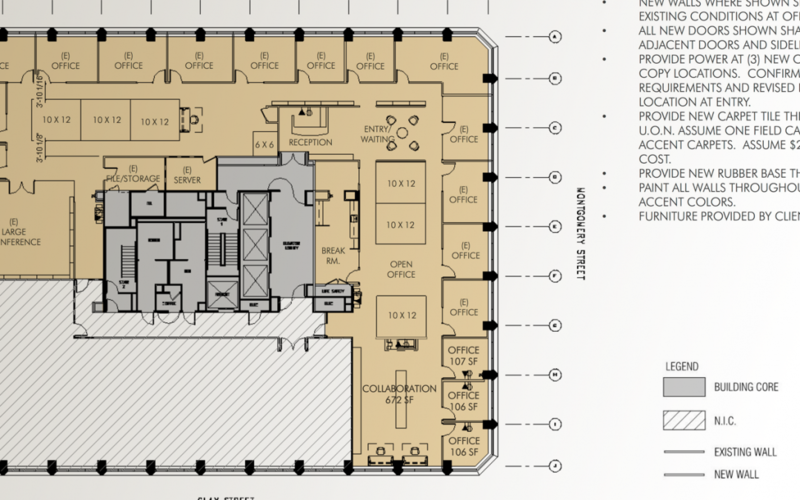 The new space is also more efficient than at 353, representing additional savings for D&M. We enjoy a long-term trusting relationship with D&M – founded on multiple successful transactions which continue to exceed the firm’s financial and spatial objectives. Read what Dillingham & Murphy has to say about our work.